The Spot Success Stories and Photos. 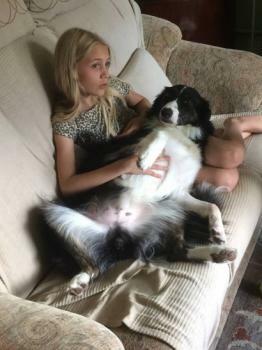 This is a bit of a long shot but if the person who adopted Lottie in 2014 could send us in an update we would so love to hear how she is getting on as the two sisters where so traumatised when they arrived. Dottie still has some fears but we are sure one day she will get there. 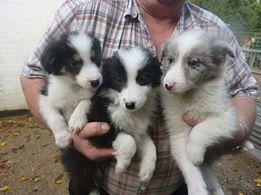 You can see Dottie’s progess on our Facebook Group. This is Lexi, (formally Narla). She came to us from you last July. 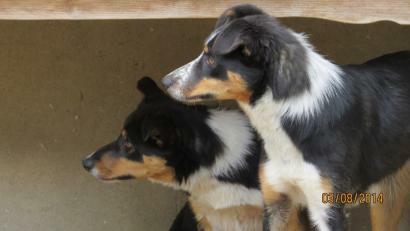 She originally came to you as a puppy with her sister and 3 brothers from Northern Ireland. She now lives at her forever home on the Wirral. 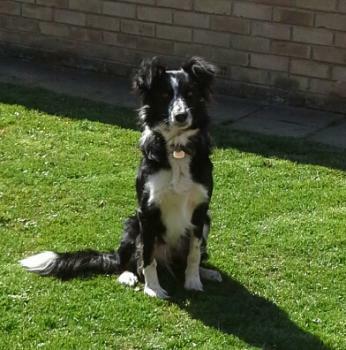 She loves playing on the beach, taking long walks in the countryside and is very interested in sheep! 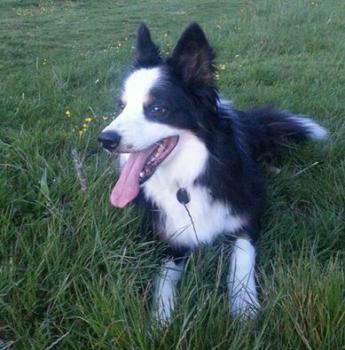 Lexi also loves to travel the short journey to the hills and mountains of North Wales. 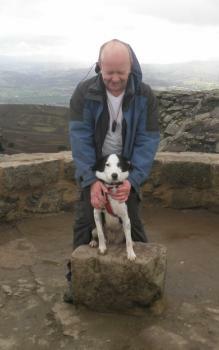 Here she is on her first mountain cairn taken on Moel Famau in Flintshire. She has settled in from day one and is very happy and contented with us and our 3 cats. Lexi has attended Puppy School and now continues to go to Canine Academy. She has 3 rosettes for her obedience classes and is a very quicklearner. Thank you very much for letting us have Lexi. She would love to know how her siblings are doing if they read this! If so, please contact us. I wonder if you remember me, Alfie. After I was left with you, I needed human company so much that I followed you around all the time. Then my new daddy came for me and took me to Salisbury where mum and dad had a lovely big garden and I was so pleased to be loved again. It was five years ago today, 31st. 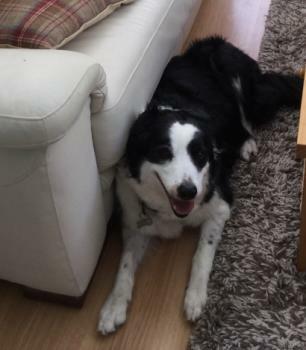 July 2011 that I came to live here and although I was scared at first that I was going to be left again, ( I would run to our car at the end of every walk in case you forgot me) I am now a happy, very well behaved and loved boy. My mum and dad and I thank you for being there for me when I was not wanted and thank you for letting me go to my forever home. With love from Alfie and my mum and dad, Jennie and David. Just to let you all know that we do have a group on Facebook for our success stories, if you are maybe looking to find siblings or just want to have a look then please click the heading to join. And please do keep sending updates in by e-mail as we do like to see them. Just to let you know Bonnie is now a boisterous and happy girl. She has learned to play and loves her toys, understood after two days that she had her own bed and didn’t have to sleep on the floor and that she wasn’t going to be shut out all night. She is the most loving dog, adores a cuddle but will wave her legs around and nearly poke one’s eye out but we are working on that. She’s still a nightmare on the lead but as good as gold off it. She comes out with me when I’m riding when I’m not doing any road work and has already had one holiday and behaved beautifully at the hotel and is always a welcome guest at our friends’ when we need to leave her. She is very good with the grandchildren but does get over excited if they scream! It worries her I think but there’s never any aggression. She has now been with us nearly eight months and we wouldn’t be without her. 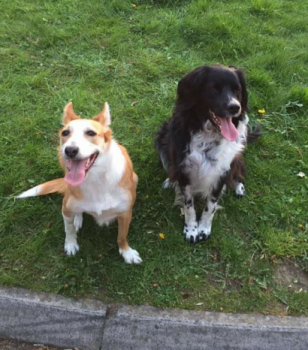 She and Buddy (the dog we look after twice a week) adore each other and she gets on extremely well with the two dogs where she stays. She is tentative and submissive with strange dogs but once she realises there’s nothing to fear, she’s fine. We love her to bits and are so grateful to you for letting us have her in our lives. I’m adding some photos so you can see how she’s looking. I think I told you she burst all her stitches when we had her spayed and had to be resewn and wear the cone of shame, I don’t know who was most pleased when the stitches came out and she could discard the cone and stop clearing the coffee table and knocking our legs from under us. Despite being told to keep her quiet,(an impossible task as she insisted on flying round the garden and hurdling the daffodils) it was a losing battle but she did stay sewn up the second time and now you can’t see the join! I thought I’d write to let you know how well our pup, who we adopted from you in summer 2012 as an 8 week old, is doing. 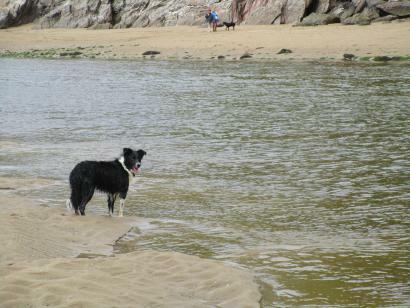 A couple of pictures of our lovely boy Acorn, from our recent holiday in south Devon, are attached. You might remember you hung on to Acorn (he didn’t have a name at that stage) longer than his siblings because he was the runt and very small, and you were concerned he might not grow normally. By the time we contacted you, you seemed reasonably confident he would probably be OK. You also told us what a lovely nature he had, which was important to us as our boys were 4 and nearly 2 years old, and we had an older (at that stage, 10 years old) and somewhat grumpy dog. You weren’t wrong about Acorn! 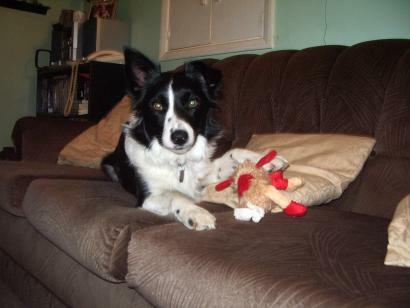 He is very sweet natured, a lovely dog, full of collie energy but very laid back around the house, and bags of fun. As you can see, he also loves water, though he refuses to swim – he keeps everyone entertained by jumping in and then chasing the splashes! He is also great with the children, and with our older dog (still with us, nearly 14), and goes to work with Dave every day. We are so glad we came to you and found our lovely Acorn through you, and I am sure you would be very proud of the tiny pup you let go to us three years ago if you could see him now. I hope all his brothers and sisters as doing well and that they all found their forever homes with happy families just like Acorn did.